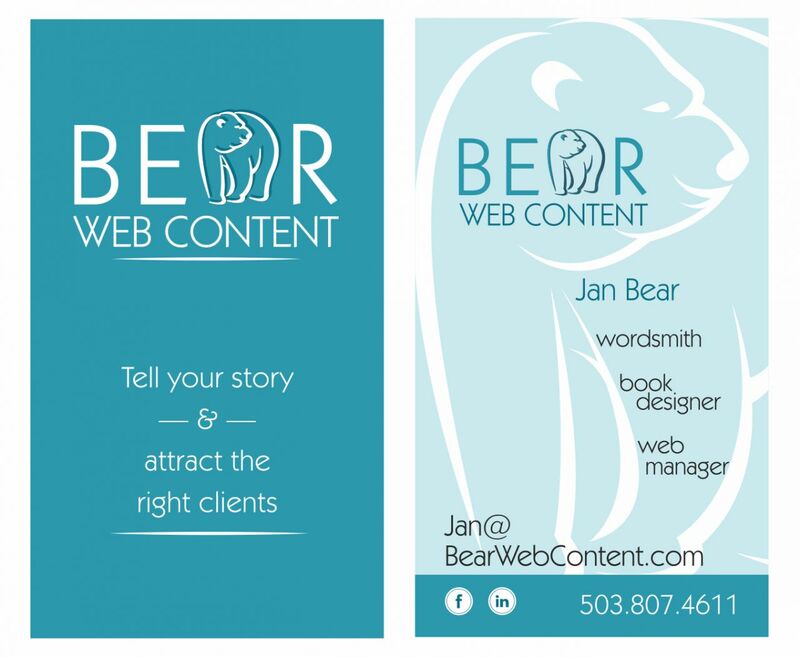 When I asked for unique business cards to replace the ones I had for Professional Web Strategies, I expected to get an attractive logo and a good marketing tool, but I didn’t know how much more I would receive. That was because I had never worked with Leslie Ann Akin, The Brand Boss. I’ve known Leslie for a few months now. A former professional clown, she has been working in graphic design since the ’80s, and I’ve seen her beautiful work product, both on the walls of her office and in the hands of some of her clients I know. What I didn’t know was that unique business cards could be so earth-shaking. As you can see in the cards above, my business cards evolved. The first one is a VistaPrint design. The second is my own design. The third is one I had done by a talented designer who did exactly what I wanted him to do. When I asked Leslie if she would create my brand (which is much more than simply creating unique business cards), she gave it some thought. Eventually she told me she was having trouble fitting the name “Professional Web Strategies” to who I am. Yeah, I thought. I have trouble with that, too. I picked the name as a “professional”-sounding description of what I do: web writing, blogging about web-related topics, web maintenance. It didn’t say anything about my love for book design — that didn’t fit under the umbrella. It didn’t say anything about my fiction writing. Again, not under the umbrella. The truth was that I was never quite comfortable with “Professional Web Strategies.” Sometimes even I got it wrong, referring to it as “Professional Web Services.” True but wrong. It’s a good name for somebody maybe, but not for me. We talked about it for a while, checking the availability of different URLs, and landed on BearWebContent.com. I bought the domain name and started thinking about what would be involved in changing my business identity. I got a call from her the next morning, Saturday. She had spent two hours the prior evening looking for the right bear. “It was hard to find something between a teddy bear and a bear that looked like it would eat you alive.” That morning she had five sample designs to look at. They were all good, and they called me to rethink my tagline and how I described myself. I had errands that morning and didn’t have time to think about it, but she invited me to come by her office that afternoon and work it out with her. She listened to my thoughts about fonts and colors — and more important, she listened to my reasons, even as I struggled to explain something hard to put into words. She made some changes. Nothing major — all five were better than I could have imagined. But starting with the one I loved, she made it better. When it was done, it was more than a unique business card. It was a vision board in text, image, and color. It was a card to aspire to. That card — I will not only hand it out to others, but I post it on the board above my desk to remind me who I am, at my best, at the essence of my business life. There are a lot of designers who will listen and give you exactly what you want. But The Brand Boss gives you what you need but can’t explain. A brand is more than a business card, but the business card holds the seed of the brand. A brand is an experience — your experience as a business person and your clients’ experience of your work. A brand is logo and color and type. It’s also a story. For me, it’s the story of a bear moseying along, looking this way and that. Wordsmith • Book designer • Web manager. I wish you a similar experience. Make sure your domain is purchased under your own Go Daddy account. If it wasn’t, you should request to have it transferred. There is no cost to transfer and it keeps you in charge. Thanks. I bought it from NameCheap, and it’s really my account. Awesome! Your cards turned out nice.